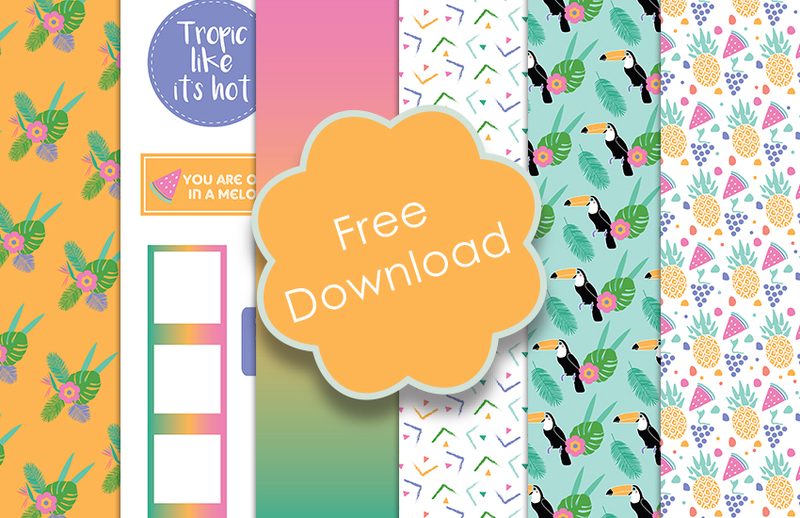 To capture the vibrancy of summer, we have designed the most colourful and fun paper download for you to delve in to (how adorable is that toucan pattern?!) If we could decorate our walls (or ourselves) with these papers, we totally would. Today, Maxine is going to show you how to make a few summery makes including this funky party bunting! 1. Cut 5 triangles 6.5cms across by 10cms each side. 2. Cover each triangle with a different paper design from the free download, trim the edges. Punch two holes at the top of each corner to thread ribbon through. 3. Cut some of the images from the topper sheet, layer on to the triangles with 3D foam pads. 4. Add the Simply Creative stickers to your bunting to spell the word PARTY. I’ve layered some of the stickers to add dimension. Add Simply Creative gems along the top of the bunting to make it sparkle! 5. Thread your chosen Dovecraft ribbon through the bunting. How fun is this bunting design? You could also make summery bunting to hang up in your home because you can never have too much bunting in your house! If you’re going on a picnic or getting ready for a summery bbq (because lets be honest, no’one can resist the yummy goodness that comes from a bbq!) you could make a napkin wrap with the juicy watermelon and pineapple paper with an added topper. If you’re on the look for creating a party gesture or a personalised gift bag, this download is perfect! Simply layer the designs on to a plain gift bag and decorate with flags and toppers to really make it pop! If you want to upcycle smaller gift box to hold a tropical treat, Maxine has also created a cool box design and decorated it with different paper designs from the paper download to make it super enticing! This free paper download totally is revving us up to craft for our summer parties! How will you use the free papers? Don’t forget to #trimcraft when uploading to social media and to share your makes in the Inspiration area!